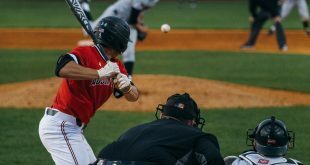 After taking a weekend series from Michigan State, the Austin Peay Governors baseball team returned to the diamond for a mid-week contest against the Western Kentucky Hilltoppers at Raymond C. Hand Park. 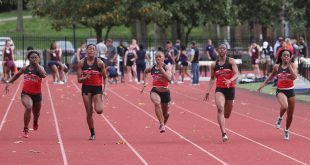 The two teams played for the 149th time in the schools’ history, with the Hilltoppers winning the past six matchups against the Govs. 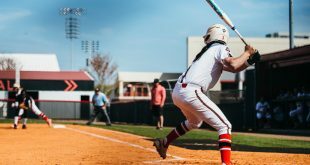 But APSU halted the losing streak Wednesday, defeating Western Kentucky 7-6. The Govs got on the board early in the bottom of the first with a RBI double by Craig Massoni, RBI single by Monday’s walk-off hero Cody Hudson, and a throwing error by Western Kentucky starter Josh Bartley to make it 3-0. Western Kentucky answered back in the second and third innings to tie the game off Gov’s starting pitcher Jared Carkuff, but APSU scored two more off another key hit by Hudson in the bottom half of the inning. In the top of the fourth, the Hilltopper’s first baseman Regan Flaherty homered over the right field fence, a three-run shot, to allow the visitors to take the lead 6-5. Both teams went scoreless for the next three innings until Jordan Hankins came through with clutch hit in the seventh, a RBI double to tie the game, then Massoni followed with a single to score Hankins, giving APSU the lead. It came down to pitching in the last half of the game, with Kacy Kemmer pitching four innings while only allowing one hit. Kemmer was awarded the win, with closer Tyler Rogers earning the save in the ninth, his sixth of the season. Raymond C. Hand Park will be busy this weekend, as three teams along with the Govs will take part in the Riverview Inn Classic. APSU will take on Milwaukee Friday at 3:30 p.m., vs. Creighton Saturday at 3:30 p.m., and vs. UALR Sunday at 2:30 p.m. to wrap up the tournament.